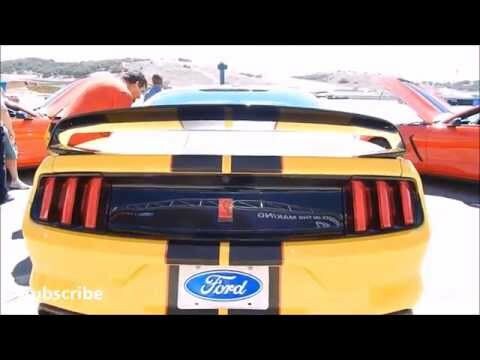 When we had our opportunity to drive the Ford Shelby Mustang GT350R at Laguna Seca it blew us away. It was powerful, but managed to handle very well thanks in part to its suspension setup. But most of all it was a track beast. Comparing it to the Dodge Challenger SRT Hellcat is an apples to oranges comparison. The Hellcat may offer 707 horsepower, but it can also easily be dialed back for an enjoyable long ride. The GT350R is ready for the track at all times and as such provides an uncompromising ride no matter where you drive it. The Rolex 24 may start in just a few hours, but on January 29th the Ford Shelby Mustang GT350R-C managed its first victory at Daytona International Raceway. The race opened the Continental Tire SportsCar Challenge season and it started the way that Ford wanted. Not only did they win the race, but they managed a 1-2 finish. Billy Johnson and Scott Maxwell piloted the winning GT350R-C for the third victory by the competition version of the GT350 in the series (the first of the new season). The battle for first became between the two Mustangs when the Porsche of top challenger Matt Plumb had fuel pump issues forcing him out of the race. The Ford Shelby Mustang GT350R is a track focused car. The high revving V8 has flat-plane crankcase that you can take all the way up to 8,200 RPMs. The 526 horsepower output makes the performance very good, but it is the independent rear suspension that makes a huge difference in handling. Around Laguna Seca’s infamous corkscrew it makes all the difference.